They are used to shape knitted pieces, and in clothing can be used to make darts or shape shoulders. 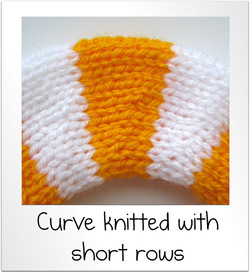 Short rows can also make curved knitted pieces, such as in donut rings or spheres. 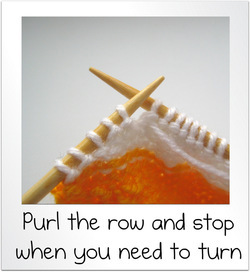 When you make a short row you will stop knitting part way through a row, turn the knitting and add a short row. You will note in the picture that there are more rows on the outside of the curve than there are on the inside of the curve. To do this I stopped knitting before the end of the row (the inside of the curve) and added extra short rows so that the outside of the curve is wider. 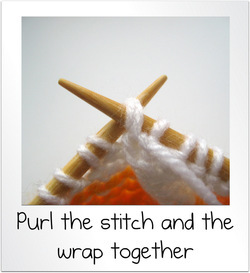 When do you make a short row, and wrap and turn? 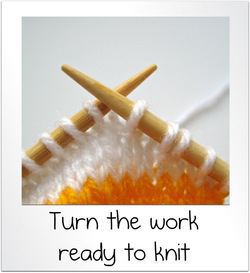 Most knitting patterns will tell you to turn the work, and this is where you make a short row. 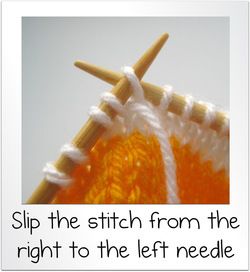 I confess this does look difficult, and I often have to refer to my notebooks to get the steps right when I do this, but it is easier with a bit of practice, and you don’t need any additional knitting tools. 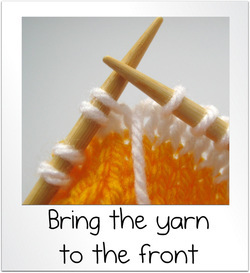 If you want to knit along with this tutorial, I have cast on 20 stitches and worked about 10 rows in stocking stitch. I am working in stripes, and in the tutorial pictures my working yarn is white. 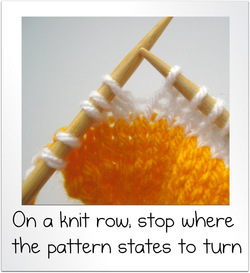 These are the instructions if you need to turn on a knit row; this is row 1 in my tutorial. The pattern states “K15, turn”. So I have knitted 15 of the 20 stitches on my knit row as normal, and stopped ready to turn. The 5 stitches on the left needle have not been knitted yet. Now I need to wrap the next stitch. Slip the next stitch purlwise from the left needle to the right needle (this is the 16th stitch on the row). The working yarn is still at the back of the work when I do this. 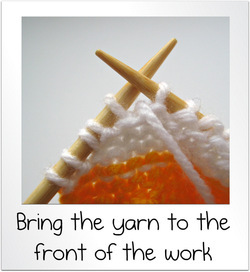 Bring the working yarn forward between the two needles so it is at the front of the work. Remember the stitch that I slipped at the beginning? 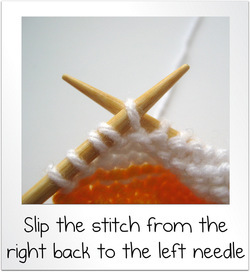 Now I slip this stitch from the right needle back onto the left needle. 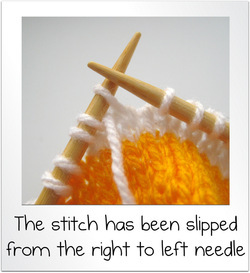 There are now 5 stitches on the left needle again that have not been knitted. 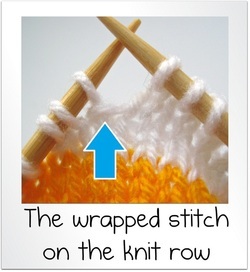 Take the working yarn from the front to the back of the work between the two needles, this "wraps" the stitch. Now I turn the work so the purl side is facing me ready to purl on row 2. Remember in my example there are 20 stitches on the row and I have knitted 15 stitches before turning, so the 5 stitches pictured on the right hand needle have not been worked. 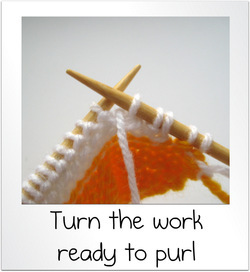 These are the instructions if you need to turn on a purl row. The pattern for row 2 states “P10, turn”. So I have purled 10 stitches and stopped ready to turn. There are now 5 stitches on the left needle that have not been worked. Now I need to wrap the next stitch. 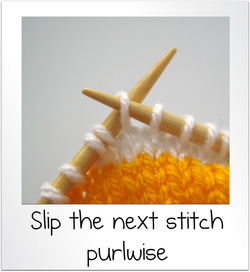 Slip the next stitch purlwise from the left needle to the right needle. The working yarn is still at the front of the work when I do this. 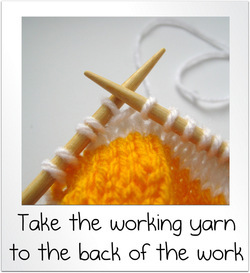 Take the working yarn back between the two needles so it is at the back of the work. 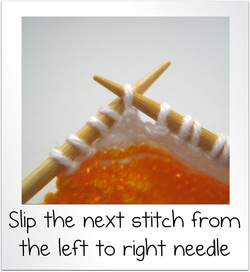 I take the stitch that I slipped before and slip it from the right needle back onto the left needle. 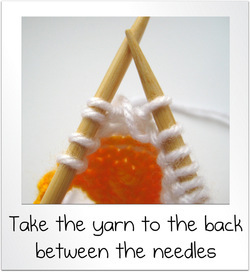 Bring the working yarn from the back to the front of the work between the two needles; this "wraps" the stitch. Now I turn the work so the knit side is facing me ready to knit row 3. On rows 3 and 4, I will be working the wrapped stitches, and I will need to pick up the wraps so there are no holes in the knitting. Row 3 states “knit all the stitches”. I have 15 stitches to knit on my left hand needle after turning; the first ten are from the short row, so I knit these 10 stitches as normal. The 11th stitch has the wrap, and I need to pick up the wrap to ensure that there are no holes. 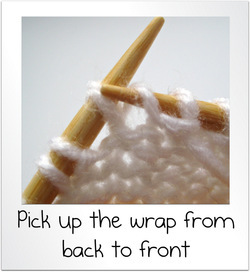 Most patterns will not tell you where to pick up, so it is useful to know what the wrapped stitch looks like. As you can see in the picture, the wrap lies horizontally across the stitch, so it looks quite different from the other knit stitches. 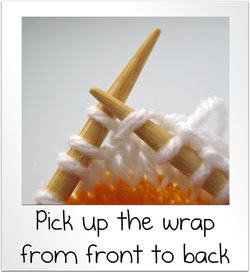 Pick up this wrap with the right needle from front to back. 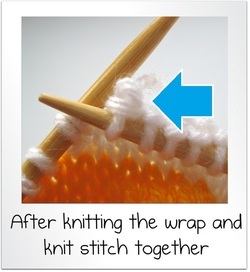 Then insert the right needle into the stitch that is wrapped on the left needle, and knit the wrap and the stitch together. After this step, at the back of the knitting, it looks like I have knitted two stitches together, as there are two loops around the back of the knitted stitch. Now I can finish knitting the rest of the stitches on this row. On row 4, I have to purl all the stitches, but there is a wrap that needs to be picked up; the 16th stitch on the row. 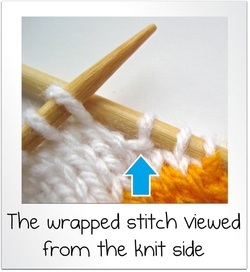 You may find it easier to spot this wrapped stitch from the right side (knit side) of the work, as you can see the horizontal wrap around the stitch more clearly as shown in the photo. 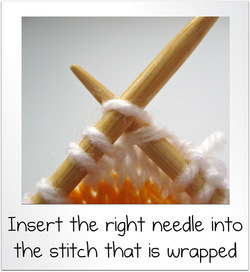 From the wrong side (purl side) pick up the wrap with the right needle from back to front. 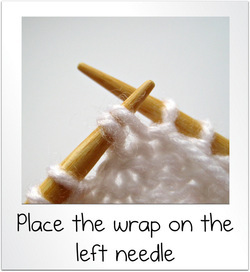 Now place the wrap onto the left needle. Purl together the stitch that is wrapped and the wrap that was just placed on the needle (just like purling two stitches together). Now I finish the rest of the row with normal purl stitches.